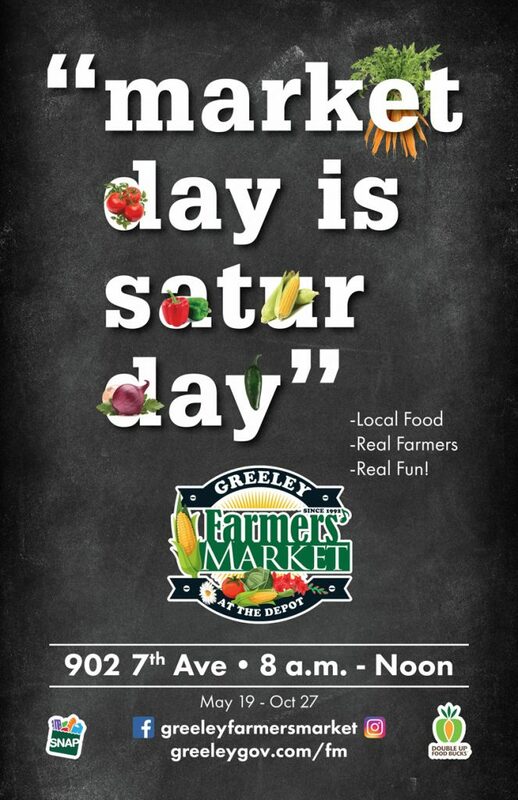 2018 marks the 26th year for the Greeley Farmers’ Market. The Market is a great venue for both vendors and customers. Our vendors offer a wide variety of locally grown and produced food products including in-season fresh produce, meats, honey, breads and other baked goods, roasted chiles and much more. In addition, there are great gifts and sundries from local artisans and crafters. The Farmers’ Market is a great place for families and to meet friends. Every Saturday, from 8 a.m. to noon there is live entertainment by local musicians. Plenty of breakfast food onsite. Plus, some solid gardening/yard advise from Weld County Master Gardeners from CSU Extension. Other community groups host informational booths and sponsor a kid’s activity. Much happening every Saturday from May 19 through October 27. Come for the food, stay for the fun!